For as many games as I’ve played based on the Dragon Ball Z license, I could never quite emulate that enthusiasm with the Naruto franchise. It’s not that I haven’t tried. The Clash of Ninja titles, while I did get some mileage out of them, ended up being a bit too simplistic for me to keep up with them. The Ultimate Ninja and Uzumaki Chronicles games on the PS2 weren’t my cup of tea either, and Dragon Blade Chronicles on the Wii ended up being one of the worst games I’ve ever played. Rise of a Ninja and Broken Bonds for the Xbox 360 were pretty amazing though and set the standard for what I look for in a Naruto game. 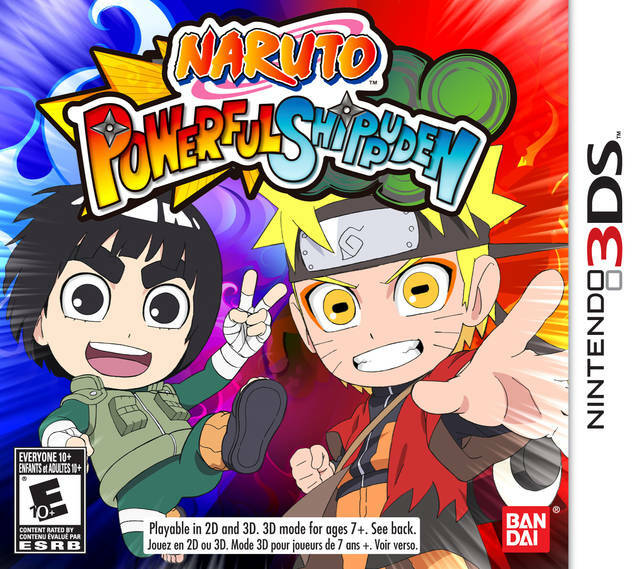 Naruto Powerful Shippuden fascinated me, as it looked as though it could provide some solid beat-’em-up action for the 3DS, while simultaneously scratching the anime itch I get from time to time. 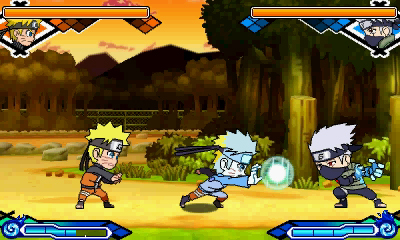 It’s also the only Naruto title on the 3DS in North America right now, so it’s worth checking out if it made the leap onto Nintendo’s latest handheld successfully. 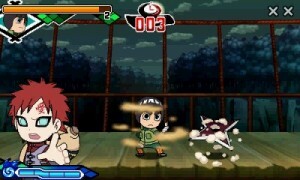 Despite its title, the game is based upon a Naruto spinoff series known as Rock Lee & His Ninja Pals. While I haven’t seen much of the spinoff series, save for the first episode, the characters are drawn chibi-style and it’s much more focused on humor than fighting. 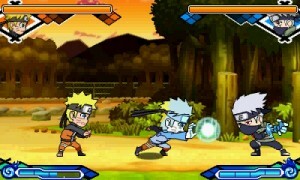 Naruto Powerful Shippuden adopts the visual style of the spinoff show, as well as includes two separate paths through the game. Naruto’s path follows the events of the Naruto Shippuden series, starting from very beginning, though it does take some creative liberties in order to make the material seem a bit more lighthearted. There was one scene in particular where, in the actual show, an important character is revived from death, but in the game is revealed to have just been woken up from a nap. As I’m not familiar with the story arcs of the spinoff show, I’m not sure if Rock Lee’s path is based on anything in particular. 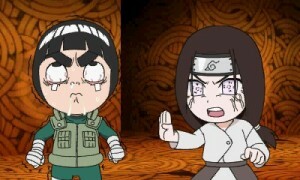 Save for the scenes that are shared with the Naruto Shippuden anime, many of the missions you embark on with Rock Lee have self-contained events that trigger at the beginning, designed to make you laugh at the hijinks he’s getting himself involved in… and it works. While much of it is just designed to explain away the fact that you’ll be punching out toads and snakes for several minutes, you can’t help but find humor in Guy Sensei wearing a ballerina outfit in order to surprise enemies and Rock Lee spending an entire mission perfecting the art to throwing his eyebrows like shuriken. While the visual style is certainly consistent with the lightheartedness that the game is going for, it may not be for everybody. I can see why they went for it, as it’s more suitable for the smaller screen of the 3DS. However, the tradeoff is that everyone has a massive head, and it doesn’t take many characters in order for the screen to get crowded. In fact, missions that require you to stay alive without the ability to fight back become particularly dubious on account of how difficult it is to keep away from such large sprites. 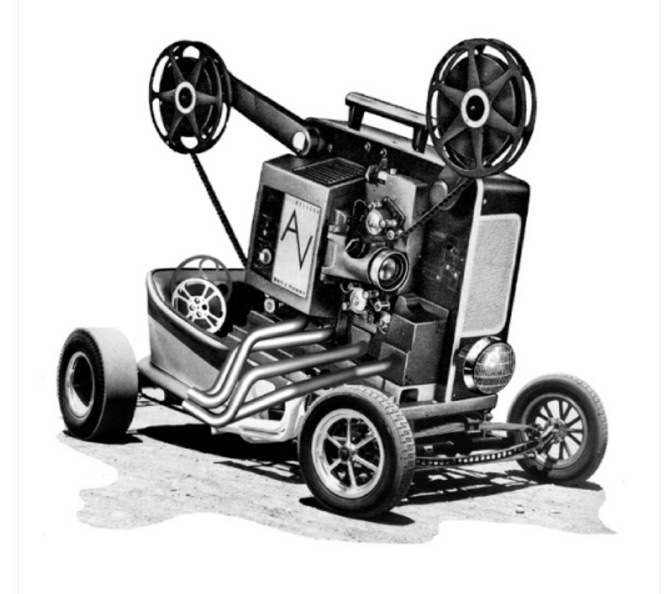 Also, while you can enable the 3D effect for this title, the results are barely noticeable. It’s best to leave them off and save yourself some battery life. Still, it’s nice to see familiar locales recreated within the game, and having the story told via still portraits and text isn’t bothersome. The music in the game sounds like it’d fit right into the soundtrack of the Naruto Shippuden anime. It’s very reliant on wind instruments, while still being upbeat in nature. I was very surprised to see that there was no dub at all in the game; all characters maintain their Japanese voices. This isn’t a big deal, since there is very little voice acting, save for a few quips when you begin a new mission and when characters announce their attacks. You end up reading all of the dialogue between characters. I guess it just caught me a bit off guard since most games end up doing the opposite, in that they keep the English dub and drop the Japanese language track. Regardless of whether you choose Naruto or Rock Lee, the controls for both are pretty similar. You can jump with B and do normal attacks with Y. The X and A buttons are reserved for special attacks and dashing respectively, though both draw from a chakra meter that can only be revitalized by landing regular blows. As you progress through the missions, you will unlock support units that can be summoned at will, with up to three equipped at any given time accessible via the L button. You can guard by using R, and hitting the button at the right time will allow you to do a substitution/evasion, though this also uses up chakra. Using R in combination with either X or Y will trigger that character’s special attacks, which can change depending on whether you’re on the ground or in the air, as well as by unlocking more powerful versions of those techniques. Both Naruto and Rock Lee gain the ability to transform as they progress through the game, which is accessible with the touchscreen (supports and special attacks can be accessed here too) and will make their attacks more devastating. The downside is they don’t generate chakra as well as they do in their normal forms, and any attack that seals their chakra will end the transformation. Completing missions successfully will also earn them experience points that can be applied to leveling them up (thus increasing their health and attack power), gaining/powering up skills, increasing their chakra levels and support levels, and increasing resistances to things, such as poisons. No increase is ever permanent either, which is nice if a mission calls for having a particular skill, as you can unlearn certain things and apply them to another. Though if you just want to replay a mission and build the experience that way, you can do that too. The main mission mode is comprised of a series of forked paths marked by missions that are approximately five minutes in length. Their short length lends well to handheld play, as it’s easy to pick up and put down, and failure doesn’t result in a huge loss of progress. When you begin a mission, you have the opportunity to select your supports and level yourself up with any available experience. You can also choose handicaps for yourself, such as not taking damage or completing the mission within a certain amount of time. Failing the handicap doesn’t end the mission for you, though if you are successful, you’ll be awarded a multiplier for any experience gained. This is good, since some of the missions can get downright frustrating without worrying about additional challenges to tack on top of it. Each mission has a suggested level associated with it, and some can only be unlocked with keys earned from completing certain missions. 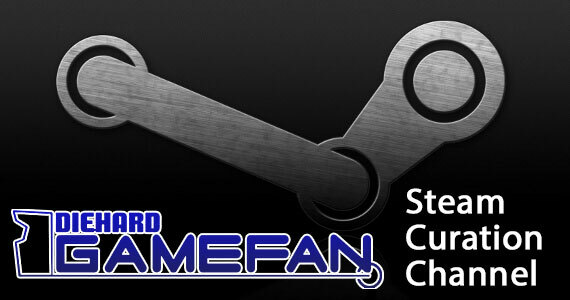 Some even require you to earn keys using the alternate character, so both story branches are generally played side by side. Mission objectives vary between defeating all enemies on screen, to racing towards a goal, to even bursting explosive balloons. There’s a decent variety of mission types, though you do tend to see patterns in them after awhile. I would’ve preferred a more traditional beat-’em-up experience personally, though the combat is a bit simplistic to sustain an entire game’s worth of thrashing the same handful of enemy types. There’s also not a ton of variety in scenery either, and many missions take place on a single screen without side-scrolling at all. Even though Naruto Powerful Shippuden is easy to grasp, both characters have tutorial stages that walk you through each leg of the controls. New mission types are usually accompanied by explanations, so you always know what to expect before you begin. 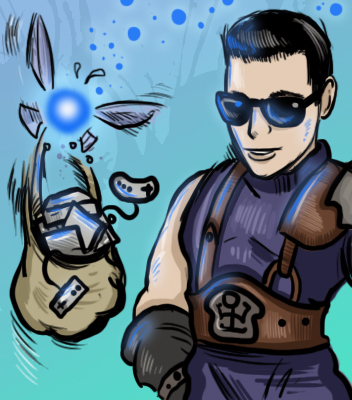 Missions that are required in order to gain a new ability will also hold your hand during the proceedings, but manages to do so without being intrusive. 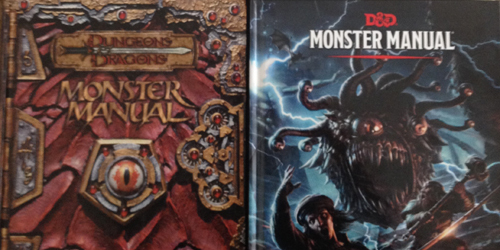 Despite the short mission length, there is quite a bit of content here. It’s difficult to count due to their arrangement, but I would estimate that there are over a hundred missions between the two paths, as well as an Endless Mode that unlocks once you reach a certain point in the story (which operates exactly as advertised). At the end of the day, it’s a solid game with a comical art style that will provide a few laughs and some entertaining action platforming. I’d have enjoyed a bit more depth and mission variety than what’s here, but they could’ve certainly done much worse. Naruto Powerful Shippuden is based upon the art style and antics of Rock Lee & His Ninja Pals, while still incorporating a humorous twist on the standard Naruto Shippuden storyline. The gameplay is solid, if a bit on the simplistic side, but offers up a plethora of bite-sized missions for both Naruto and Rock Lee’s paths. Completing missions will net experience to power up both characters’ levels and skills, which keeps things fresh for the most part, though the repetition in mission types will begin to set in after awhile. Some of the missions can even become frustratingly challenging on account of the large noggins of each character that crowd the screen, making escaping danger more a chore than it should be. Still, for a Naruto licensed game, it’s a decent effort, and fans looking for something a bit more lighthearted and easy to pick up and play are in the right place.